I must confess that I never particularly cared for eggnog. Until very recently, I had only ever had store-bought eggnog and, while the consistency reminded me pleasantly of a thick milkshake, I couldn’t get past the semi-eggy, custard-gone-awry sort of flavor. I ordinarily like custard, too, but I basically gave up on the drink. I’d have a sip every now and again, in case my tastes changed and I found I enjoyed it, but I was far more likely to refuse ‘nog than not. This year I finally decided to give homemade eggnog a try. I searched through countless recipes and tried quite a few to limited success. I ruled out anything that involved cooking the eggs, since I already knew that wasn’t what I wanted. I did not like the recipes that needed multiple bowls for beating multiple components. Since I never exactly wanted to indulge in eggnog in the first place, I didn’t want an overly indulgent recipe, either. Finally, I came across this recipe, which I liked because I wouldn’t have to separate and independently beat the eggs and because there is no cream to make it too rich. After a few tries, a few eggs and a few modifications, I had eggnog. And it wasn’t bad! 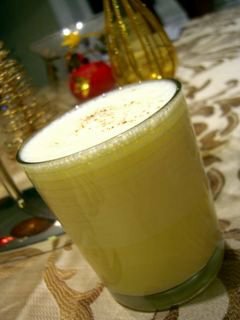 This eggnog is very easy to make and is relatively low in fat. You can use any kind of milk, though I recommend low fat. The resulting nog is creamy and slightly eggy, without having a trace of store-bought taste. It reminds me of a thin, but enriched, milkshake. The vanilla and nutmeg really compliment each other. The alcohol is entirely optional and you can substitute bourbon or rum to suit your tastes. In a large bowl, whisk together eggs and sugar until light in color and sugar is dissolved. Whisk in vanilla, nutmeg, milk and brandy, if using. Strain into a small pitcher and chill. *Note: Track down some pasteurized eggs to make this recipe if you’re concerned about eating raw eggs. Alternatively, try making a cooked variation of this recipe! I like the look of this! I have been thinking some eggnog icecream might be nice to try… but I might have to give this ago first! sorrry that was clare not farmgirl, I was logged into blogger after helping her with her template! If you’re just developing a taste for the flavor but still iffy on the texture, you might like to try this ice cream. Lovely egg nog-gy flavor with an entirely different presentation that’s great for accompanying holiday treats like cookies, cakes and pies. We’ve had it for Thanksgiving every year since I discovered this recipe. Place 3/4 cup of buttermilk in a large bowl; set strainer over bowl. Whisk egg yolks and sugar in heavy, large saucepan until the sugar is almost dissolved. Whisk in the heavy whipping cream, whole milk, nutmeg, vanilla and salt. Using a flat bottomed silicone spoonula, stir over medium-low heat until custard thickens and leaves a path on the back of the spoonula when finger is drawn across, about 11 minutes. Remove custard from heat; stir in the remaining 1/4 cup of buttermilk. Pour custard through the strainer into the bowl with the cold buttermilk. Remove the strainer; stir custard to blend. Refrigerate custard until cold, at least 6 hours. Stir in more nutmeg if desired keeping in mind that freezing the ice cream will mute the flavor. Process the custard in an ice cream freezer according to the manufacturers instructions. Handling with great care not to contaminate the frozen custard with the salty brine, transfer ice cream to an airtight container. Cover and freeze until firm, at least 6 hours. Check several hours before serving. If ice cream is very hard, alternate storing it in the fridge and the freezer until it is a scoopable consistency. I purchased some ‘light’ eggnog and I could only drink just a bit of it on it’s own. Then I mixed it with butterscotch schnapps and it went down much easier! Nice, I have all the ingredients (except for brandy) in my pantry. I’ll try it with soy milk, because the Silk soynog that I’ve been seeing looks awfully cute in that green packaging. I LOVE egg nog… have never made it from scratch but it sounds easier that I would expect. I have never had commercial eggnog. It’s not common, thus unavailable here in Manila. Though I don’t crave for it at any other time of the year, somehow it’s just so apropos to make it during the holidays. I am told that if you don’t cook the eggs, you need the alcohol to kill the unwanted bacteria that might be lurking around them. How bout this, I call it ‘Vermont Eggnog’: 1 fresh raw organic egg, 1 cup fresh raw organic milk, 2 or 3 teaspoons organic maple syrup. If you can get the ingredients, delicious. my family does something like this, but instead of whisking we just throw all of it into a blender, and we don’t measure whatever you feel like having today is the way to go. Want it thicker? Add an extra egg or two. Want it sweeter? add more sugar. so yeah, I lie no bake recipes, does anyone know about a non-bake chocolate type? I make this every Christmas, we use free range farm eggs, cream, a small amount of milk, sugar, and Bourbon. We also use freshly grated nutmeg on top for a kick We make Gallons of the stuff usually on Christmas eve, its great and everyone drinks it. We get requests every year from family and friends. My husband spent many years in America and brought back the receipe with him although we make our own version of the original and don’t weigh anything. Easy Homemade Eggnog (cooked) | That's Cooking!